They were working more on the demo of the old DFA building the other day so we stopped by to take some photos for work. 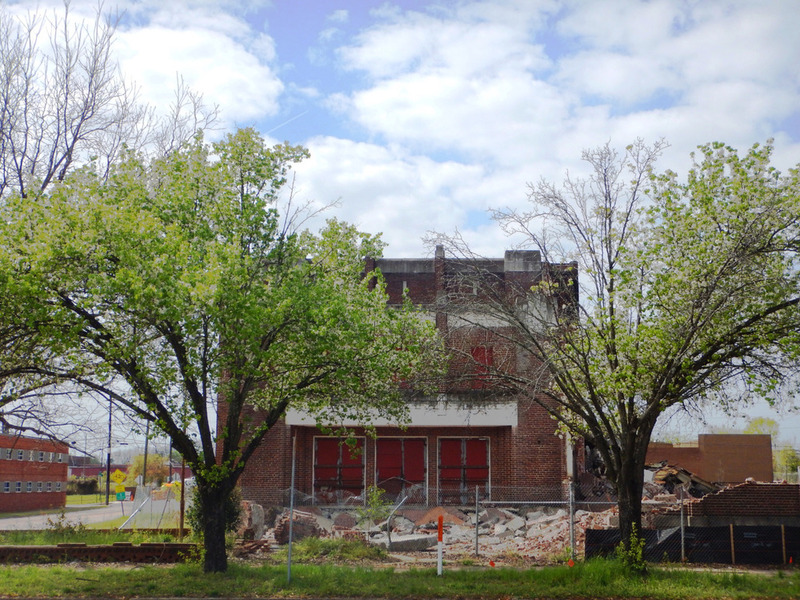 I’m sad to see this building go… not just as an alumnus or a preservationist, but as someone who lives and works in this town. There are so many buildings in this area that have great potential that end up sitting vacant for years and eventually torn down. The reasons are varied. Sometimes an investor doesn’t have enough money to make an offer. Sometimes the owner is unwilling to sell. Sometimes the government gets in the way. Sometimes people just aren’t interested. I don’t think it’s helpful to point the blame at anyone and that’s not really my point in all this. My point is that old buildings bring character to downtown areas. People don’t want to live downtown because the buildings are brand new. They want to be able to visually see the history of what makes this town what it is. Historic buildings hold stories and memories that will disappear over time without a physical reminder. I’m tired of seeing perfectly good buildings torn down to make a parking lot when they could be repurposed. There are plenty of success stories that should sway anyone who thinks otherwise. The truth is that we don’t always need the newest, biggest, and trendiest thing. Sometimes the best buildings are the ones we already have.